No, I was talking about the 2 new buses sitting at Kedzie with no markings, all white/gray bus. Although I knew what you were talking about from the context, you might have thrown others off by calling them hybrids when actually they're full electric buses in terms of propulsion. The motors run only on the electric charge from the buses' batteries and aren't run on diesel at all. Any diesel fuel in the buses are tied to the buses' environmental systems (AC and heating if I recall correctly) only. Just wanted to give you guys heads up that one of the two XE40's was parked by #7955 @ South Shop earlier this morning. However, it's gone after I tried to see if it was still there before I've spotted 3 new Novas. On a somewhat related note, Tribune has a column abut the Proterra buses. Of note there is that while purchases are only from stimulus funds, some transit authorities think that they will pay for themselves comparing the cost of electricity vs. diesel fuel, and that Proterra is getting the cost down from $1 million to $800K. However, it also mentioned that some potential users have access to hydropower, which Chicago apparently does not. Went to Kedzie Garage today. Got an upclose and detailed look at the XE40s, #700 and #701 have been wrapped "Electric Bus" One is wrapped all green (#700) the other is all blue (#701) They will unveiled to the public once the bugs have been worked out. Theyre estimating about two weeks. Wasant allowed to take pics. Went to Kedzie Garage today. Got an upclose and detailed look at the XE40s, #700 and #701 have been wrapped "Electric Bus" One is wrapped all green (#701) the other is all blue (#700) They will unveiled to the public once the bugs have been worked out. Theyre estimating about two weeks. Wasant allowed to take pics. I'm sure Durbin will need the photo op before the election. Well since this is any Transit Bus companies' move into an all-electric, trackless bus format, there will be lots of bugs to work out, even in revenue service, hence why CTA only ordered two for a test period, which is probably no more than three years like the 5900's. I just hope they don't sit down at South Shops wasting away after the fact like the 5900's are. And there's no excuse about pics, CTA5750... one of your duties on this forum is to get the scoops and be Jimmy Olson with a camera! j/k.... we don't want you to get into trouble. Don't you mean Da Mare(Emanuel)? Durbin's election comes up first, and, of course, his personal money is the source of all federal grants, including TIGGER ones. Of course, Rahm will be there with Claypool standing somewhat to his rear and right. But my remark was more directed to the time constraint of the unveiling. If I ever see them at South Shop again, I'm sure as hell taking advantage by taking some shots of them. 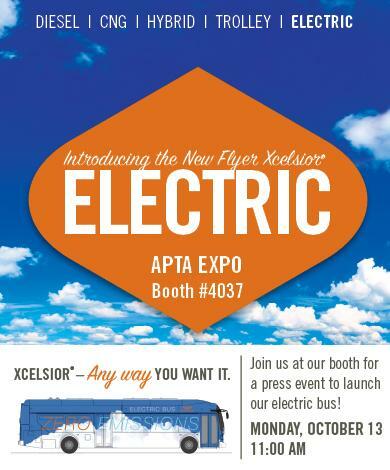 Aren't the XE40 being revealed at the APTA convention on October 13th, 2014? Since the conference is in Houston, it doesn't necessarily mean one of those 2 buses. Maybe to clarify JuniorZ's issue, did the wraps also say CTA? New Flyer could've put up a red light on a CTA Press Release until after this APTA Convention Event in Houston(they are working in conjunction with the CTA since it is a test bus, I'm sure). Besides that, we don't even have charging stations built. CTA is going to have to work with Com-Ed and CDOT(or whatever other company the city outsources to for construction projects) to rip up a section of sidewalk or pavement to put in a base and the charger unit at the designated garage(looks like Kedzie currently) and whatever route(s) the CTA plans to test these two buses on(which may be explained at the press conference if the CTA has decided yet). Granted, putting in chargers may only take a few hours tops, but have we ever seen a road construction project get finished right on time in Chicago? A few hours!! It would take that long to bring over the work materials. LOL!! I wonder if there's any current construction at Navy Pier because I believe Union Station/Canal is going to be revamped as part of the bus terminal they plan on building there (still) I thought I might have even read somewhere they plan on moving the Mega bus terminal and all other coach buses that stop in front of Union Station and making them layover around the Clinton Blue line or Van Buren/Canal, probably to be moved permanently to the new transit terminal when that's done. This may be because the BRT lane project will be going on Madison and Canal is part of the project? So it doesn't sound like a charging station would work there unless there's a terminal and that doesn't yet exist. A few hours!! It would take that long to bring over the work materials. LOL!! Well regardless of the fact, you can't charge a cell phone without plugging it into a computer or wall socket for power. So until the stations are built, I don't think these buses can see service. How they are moving from Kedzie to South Shops and back is a mystery(they would have to be towed via a wrecker, as their batteries are probably weakened or dead right now without being charged). I don't think you can just take a standard appliance plug and plug the bus into a wall socket... all the batteries and power this thing requires would probably blow a few circuit breakers at the garage and perhaps in buildings surrounding the garage. Pull them in after 1-3 years of testing and(hopefully) return them to St. Cloud or Winnipeg, not park them at South Shops for twelve years and scrap them/pick them for usable parts. Your low opinion of politicians is understandable, but Durbin has been consistently up in the polls so I doubt he needs the prop in these last four weeks against Oberweis. I think it got pointed out that since the buses weren't moving they keep some kind of charge on the batteries. I doubt they would have even been able to get to this stage of the game of getting test buses placed at any TA if they had to worry about the batteries just dropping down to zero from what is so far very limited use. So, for instance, why did he show up at the 95th station groundbreaking, when all the feds provided was loans? Sun-Times said he was trying to "court Black voters," like they were going to vote for Oberweis, despite that he gave some of them some ice cream. For that matter, why did he take credit for a grant that never materialized (look up 13 hybrid buses; e.g. here). He may not need the opportunity in an absolute sense, but publicity hogs never waver. You mentioned seeing a XE40 here being driven south on Ashland from who knows where(Aug. 22) when they were both already here(arrived via backdoor* June 11 & 12). Without charging stations built yet, these buses would just be depleting their battery power being driven from Kedzie to South Shops and back. Most economical way would be a wrecker towing it to it's destination(s) until the charger parts arrive and are constructed at Kedzie and eventually on whatever route CTA designates for these two buses. ...Without charging stations built yet, ..
You keep repeating that, but what is your factual basis? Have you been in the Kedzie garage? Yeah I think Kedzie has a way to charge those buses. How else could they do an internal test? Can't do it on 220 Volts. The amount of amps drawing for those bus batteries would probably blow fuses in the garage. They would definitely need a charging station. Maybe they have one, but as far as I know, they don't. I inquired to a source who visited the garage and hopefully will shed some light on what was seen in there. Tesla can do it on 220 volts and 80 amps for about 250 miles in about 5 hours, according to Car and Driver. So, the only question is the comparative capacity of the batteries (and also what kind of electric feed goes into Kedzie garage, which I am sure is not a household 220 volt feed). Then add in regenerative braking. As I noted with regard to the hybrid buses, there must be some gain there if the bus stops every two blocks. Yes, the buses do carry the CTA logos of course. The graphics are really cool. Im sure everyone will be impressed. I was! And that's my pretty much my point. Politics 101 says when you're the incumbent you still go before the voters being able to say you did something for your constituents even if some of those who are voting don't agree that it was you that did it. And under that same basic concept any politician is going to go where they see the opportunity to garner support and votes. It would be political malpractice not to take your case before every voting group you can because surprise surprise "voting group" says by definition somebody in that group is going to be voting. I think we need to not let ourselves get so cynical that a politician trying to garner or keep support among the voting public becomes on par with being a scandal.